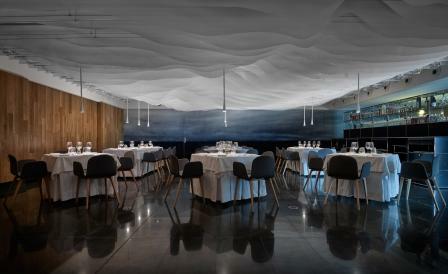 Though his oeuvre extends far beyond restaurants, the San Sebastian-based architect and designer Santos Bregaña Etxeberria of Atelier laia is the go-to guy for a host of blue-chip kitchens including Noma, Martin Berasetegui, Tetsuya’s, Alinea, Per Se, Vue de Monde and Jaan for whom he’s created interiors that skate between rigorous almost monastic minimalism, and the fantastical. His latest project Restaurante Huarte certainly veers towards the latter. Located in the University of Navarra’s museum, in a rather innocuous building designed by Pritzker Prize-laureate Rafael Moneo, the restaurant takes its name from the fabulously wealthy Spanish art patron María Josefa Huarte who endowed the museum with a fabulous collection of Picassos, Palazuelos, Chillidas and Oteizas. The interior design plays with the idea of bringing the sea to Pamplona – a sly conceit given that Huarte also means ‘island’ in Basque – by way of an underwater grotto of polished black stone floor, a lineal forest of light timber screen, a far wall painted with a moody horizon, the smart use of USM furniture and undulating cutouts on the ceiling from which drop stalactites of slender pendant lamps. Keeping in the mood, in the kitchen, chef Aitor Sarasola cooks up a surf and turf menu that includes squid noodles tossed with a citrus emulsion, seared octopus with smoked paprika foam, slow roasted kid, and boneless suckling pig.